Hello, my name is Shad Leeder. 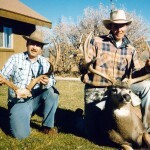 This post is number 2 of 4 in a series sharing a brief history of Leeder Hunting. 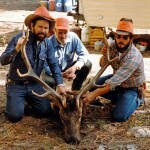 In the early 1980′s we added antelope and elk to our list of guided hunts. 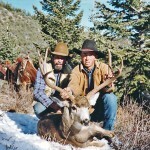 Now guiding for mountain lion, mule deer, elk and antelope in both Utah and Nevada, our opportunities seemed endless. 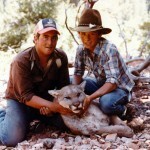 The mountain lion and mule deer populations were at all time highs, and the elk and antelope numbers were growing fast. It was about this time that we were introduced to the tag lottery system for deer, elk and antelope hunting permits. Because of the growing human population the tag lottery system was necessary to maintain quality game populations. 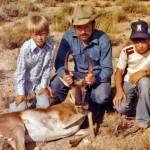 Later in the 1980′s we started guiding desert sheep hunters and that rounded out the list of game species that we still guide for today. During the early 1980′s we began to move our home base from Kanarraville, to New Harmony, about a twelve mile move. We completed our move to New Harmony in 1986 and we are still here today. 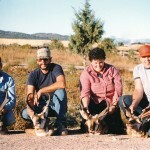 In New Harmony during the 1980′s we were surrounded by the best mule deer and mountain lion hunting in the world and it was only a short drive to hunt elk, antelope and sheep. In 1980 I was twelve years old and getting big enough to be of some real help to my dad. 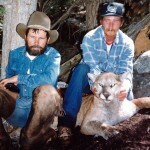 I helped dad with his hunts on weekends during my school months and every day during the summer lion hunts. By the late 1980′s I was helping dad every day. 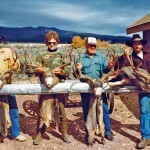 Charley Leeder, my dad, had worked very hard to build a very successful hunting business. I was very lucky to grow up in the hunting world watching and learning from him. 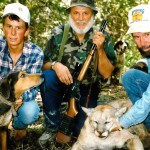 Since the mid 1980′s we have worked together to make Leeder Hunting what it is today. This is all we do and we take it very seriously.